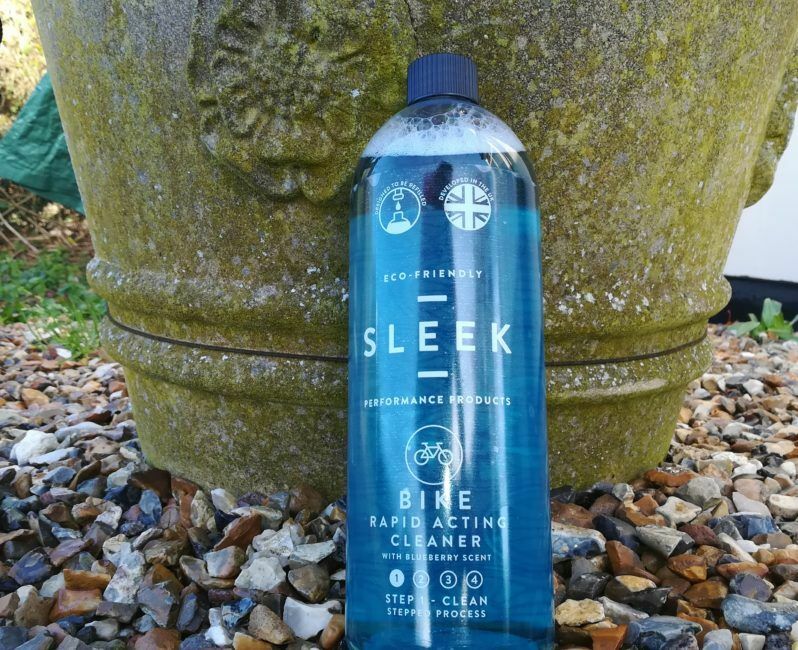 Review: Sleek Rapid Acting Bike Cleaner - ADVNTR. I like to think of myself as environmentally conscious. Hey, I ride more miles in a year than I drive, and my environmental impact is pretty negligible. So I’m pretty ‘green’ aren’t I? 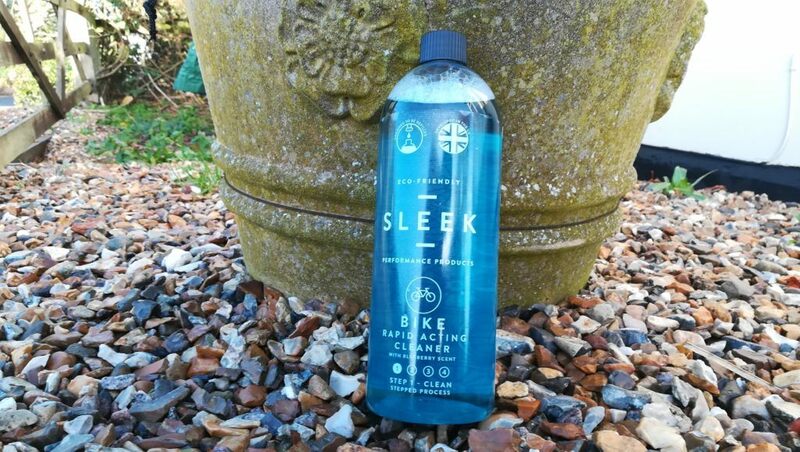 Well, that’s what I thought before we spoke to Sleek regarding their range of bike cleaning and care products. For years I have been happily applying all manner of lubricants onto chains without a care in the world. Equally, I have been merrily squirting cleaner all over the place too. I suppose I have been working on the premise that once all the cleaner and the muck has been washed away, that’s it. Out of sight, out of mind. Job done! I know it is easy to sit here and pontificate about eco credentials. Equally it is easy to ignore ‘green’ claims companies may make. We have after all, heard it all before, familiarity breeding contempt and all that. But maybe we owe it to ourselves to think about the planet a little more. Having completed a certain amount of due diligence, on Sleek and their products, I was inspired to check out the contents of my workshop cupboards. Worryingly, a significant proportion of bike related products carry toxicity warnings. They are not only potentially dangerous to health, but to the environment too. And that made me stop and think. Why hadn’t I noticed this before? This is not going to be an eco-hagiography but if nothing else, the concept that Sleek are pushing gave me a nudge to have a good look at what I am using on my bike. If I can remain environmentally neutral, well as much as possible, and the product works it surely has to be a good reason to use it. 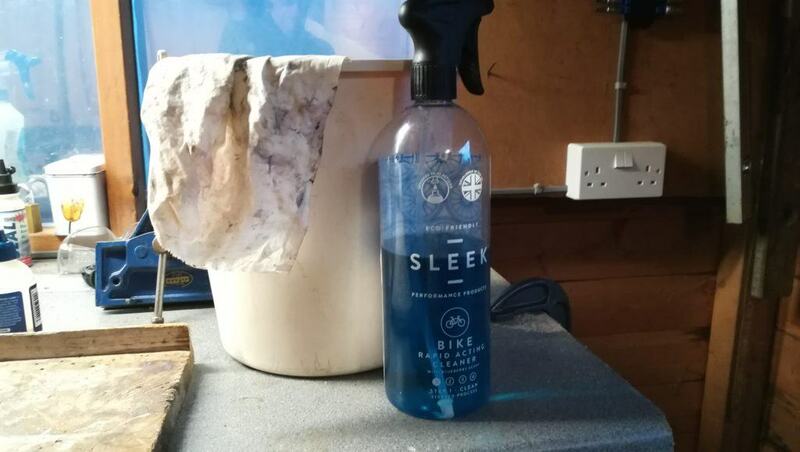 Sleek offer a range of cleaning and care products for sailing, camping and bikes. Naturally, I am going to concentrate on the cycling related products. The common theme across the range is that they are environmentally friendly (biodegradable) and are not animal tested. Our products are the highest performing eco-friendly cleaning products on the market whilst also biodegrading to 100% in just 28 days! They are also Ph balanced, phosphate free and non tested on animals. 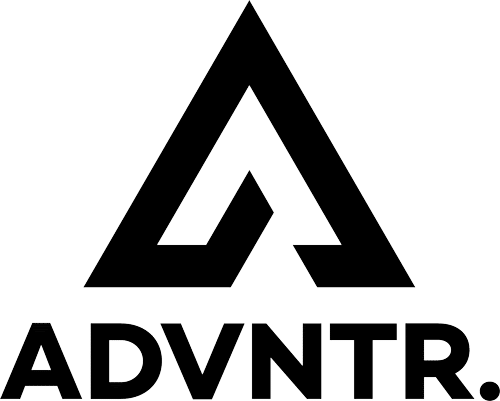 The company use a common, colour coded, theme for all their products. 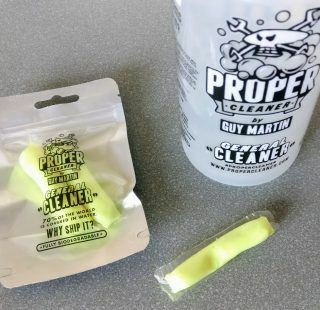 Blue for cleaning, pink for what they call ‘detail’ (within the bike context this means degreaser), grey for protection and yellow for “restore” – chain lube. I have tested the bike cleaner though I am expecting samples of degreaser and chain lube soon. My one litre bottle came complete with a spray attachment. Already diluted to the optimum concentration, give your (dirty) bike a hose down, and then follow through with Sleek and have a cup of tea. By the time you get back, the chemicals should have done their work, rinse again and wipe down with a soft cloth. This is pretty much the standard approach for all bike cleaners nowadays and this one is no different. I have to admit, I tend to take claims of superior cleaning performance with a pinch of salt. Indeed, for the first couple of washes I didn’t really notice much of a difference. As I used it more however, my grey bike began to develop a slight sheen. 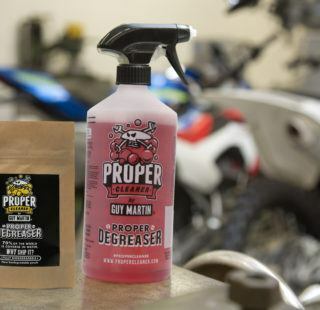 I have been using a mainstream bike cleaner for some years now. It is effective enough and I have had no reason to look elsewhere although I have generally noticed a greasy residue on the frame. It is no big deal, but the paint has become noticeably flat. The Sleek cleaner seems to have worked its way through this residue, leaving me with a shiny frame once more. Naturally, I just had to buff it up a bit more and, scratches aside, the paint looks nearly as good as new. As a cleaner, the product passes the Ronseal test. It cleans bikes pretty well. I have used it exclusively on my gravel bike. Mud, sand, road grime and more seemed to be easily removed and only on the first run through did I need two applications. A word of caution though. Don’t expect a magic, 100% showroom finish. Nooks and crannies need a little bit of persuasion to clean up and the odd smear was still evident. A little bit of elbow grease is what you need to get the optimum finish…but you don’t need much. I am not a chemist so I can’t vouch for the veracity of Sleek’s claims about the biodegradable qualities of their products. They don’t hide their list of ingredients and there doesn’t seem to be much to worry about there. One last thing. An environmentally friendly cleaner will simply wash away road grime and oil. There are no magic enzymes to break it down and render it harmless. 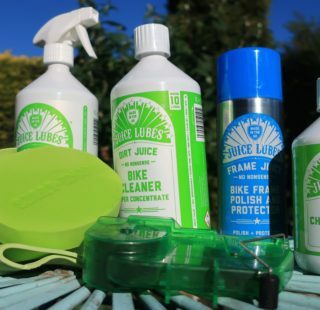 Given that the nastiest thing most of us put on our bikes is chain lube, maybe the way to become a little less harmful to the planet is to use an environmentally friendly lube in the first place. Effective Bike Cleaner which just happens to be "green" too.